By Eric Baldwin: 34-year-old Lucas Matthysse has been added to the Saul “Canelo” Alvarez vs. Julio Cesar Chavez Jr. undercard on May 6. Matthysse’s opponent still hasn’t been selected by his promoters at Golden Boy Promotions, according to Dan Rafael. The fight is expected to take place in the 147lb division, as Matthysse is moving up in weight from light welterweight. Matthysse will have been out of the ring for a year and a half by the time he fights on May 6. He suffered an eye injury in his 10th round knockout loss to Viktor Posto in a failed effort to win the WBC World light welterweight title on October 3, 2015. 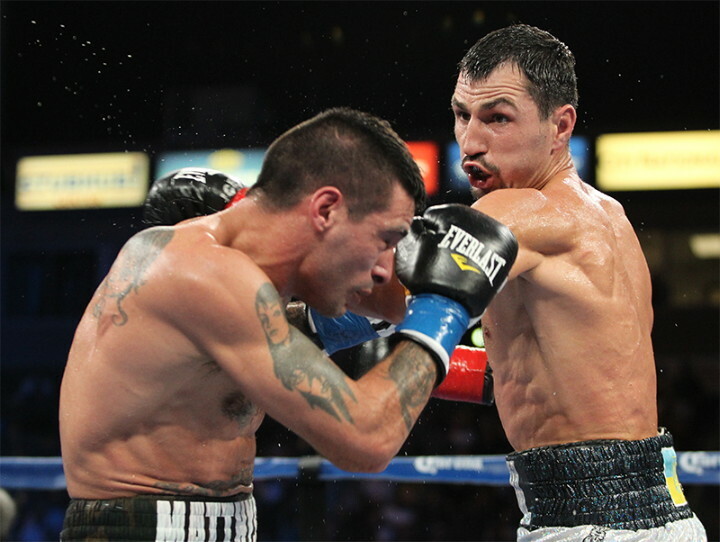 Matthysse’s lack of height and reach led to him getting out-boxed and eventually halted by Postol in round 10. It’s still not clear whether Matthysse’s fight will make it onto the HBO pay-per-view portion of the Canelo-Chavez Jr. card. Given that the card only has welterweight Sadam Ali on it, Matthysse has a very good chance of his fight being televised. The idea is for Matthysse to get in position for a title shot at 147 in the near future. There’s not much choice for Matthysse. WBC champion Danny Garcia and WBA champ Keith Thurman are fighting on March 4 in a unification fight. The winner of the Garcia-Thurman fight could be facing the winner of the Kell Brook vs. Errol Spence Jr. fight for the IBF 147lb title. By the end of 2017, we could see a unified champion holding down the IBF, WBA and WBC titles. The only belt that would be out of play at 147 would be the WBO title, which is held by the Top Rank promoted Manny Pacquiao. Matthysse could find himself in position to challenge for the unified titles at some point in the near future if he can put some victories together. Being added to the Canelo-Chavez Jr. card will give Matthysse some badly needed visibility with the boxing fans. He’s been out of action for a long time with his eye injury that he suffered in the Postol fight. Before the injury, Matthysse had beaten Ruslan Provodnikov, Roberto Ortiz and John Molina Jr. in his three previous fights. Matthysse was beaten by Danny Garcia by a 12 round unanimous decision on September 14, 2013. That was a disappointing setback for Matthyse, because he’d looked sharp before that fight with wins over Lamont Peterson, Mike Dallas Jr. and Ajose Olusegun.